Running Windows 7 HP 64 bit SP1 on Dell desktop. Default printer is HP all-in-one M1522nf MFP. Both have all current updates. Although we use a LAN, this printer connects directly to the computer via usb cable. Not feasible to connect the printer directly to the router. The printer is powered up only when printing. The printer has a display screen showing time and date. Whenever the printer is turned off, the time/date setting is, naturally, off as well, and when next powered up resumes counting where it left off, sometimes days later, so the error is cumulative. I’m trying to get the printer to read the time/date from FireFox so it stamp docs accurately- so far, no joy. Had advice to input the computer IP address into the printer memory, did that, but not sure if it “took” as it does not show up when I print a configuration report. Anyone know if this is doable? There should be a setting, either in the printer menu (on the printer) or in the printer settings in Devices & Printers, that syncs the printer with the COMPUTER (not Firefox). 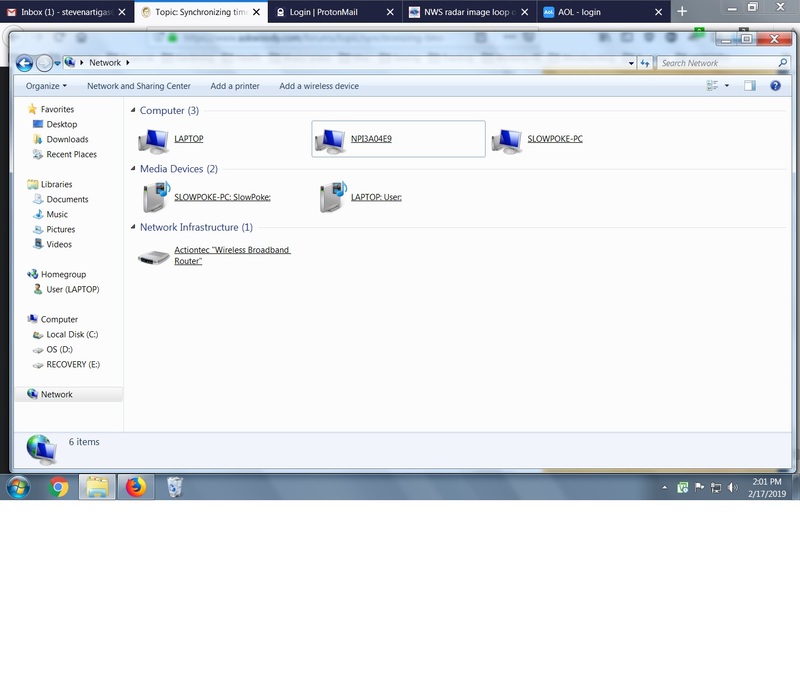 It may even be accessed through the HP software that was installed (the printer icon it put on the desktop when you installed the full-function HP software). You will have to dig for it, but it’s in one of those places. No not without great effort. Syncing the time with the computer does not seem to be a feature, and would require an separate dedicated program and perhaps that could only work over a network connection. Manually sync the time & date using the printer, reading the manual to know whether there is a remote setup program to change printer settings. If it is HP ToolboxFX, try that to see if you can change settings while using a usb connection. I’m trying to get the printer to read the time/date from FireFox so it stamp docs accurately- so far, no joy. I can’t think of anything other than inbound faxes where the time/date being printed is going to be determined by the printer’s clock. Thanks for your quick response. I have just again scrolled through all setup and menu options on the printer, reset time/date but no option to sync with computer. Checked again with HP and the latest software is already installed (most recent 11/2018). Looked at the Devices and Printers screen in Control Panel- right- and left-clicks bring up a multitude of settings, data, etc. but again nothing I can construe as linking the time/date data. Yesterday I found some instruction that called for entering the printer IP address into the router. 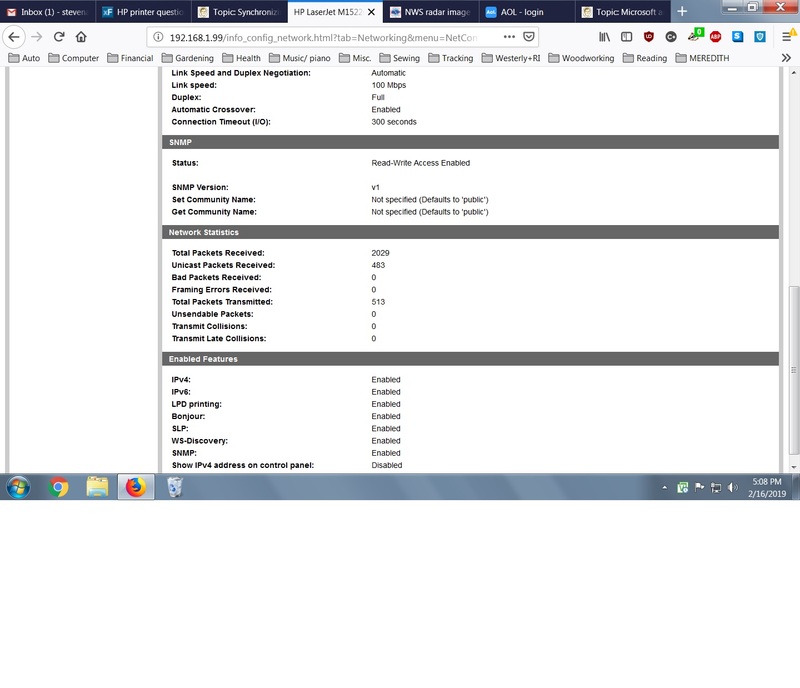 This item did not show up in the configure report from the printer, but there is a provision for manual entry using the printer keypad, did that yesterday. I went through a frustrating phone call with Verizon (ISP provider) and got nowhere but after I thought about it, realized that the printer is not connected to the router, but to the computer, so maybe inputting that IP address into the router is a red herring. I did make an attempt to do that yesterday, but the router would not let me past the login screen. I had tried my Verizon account creds but those were rejected- found a user name and p/w printed on the router label, but the login still stops me, “too many login attempts.” Not sure if this is needed anyway. Any idea of some sort of key word or phrase or suchlike to be looking for? Is it possible that this linkup isn’t possible? I looked at the manual for your printer – I saw no way to automate date/time settings. If it’s connected by a USB cable, you won’t be able to reach it via IP address (it doesn’t have one). I don’t see any provision in this particular printer to do what you want to do, and it doesn’t even look like it’s capable of querying a time server if it was network-connected. Pardon my dumb question, but does “network” mean all computers and peripherals connect directly into the router? This is a home office, with the desktop, two printers plugged into it, and a laptop which uses either wi-fi or usb cable. I believe this setup is called a LAN. There is no option of connecting the printer to the router directly, due to no available path for a cable. A networked printer would be connected (wired or wirelessly) to the same network as the devices that would print to it. Typically, in a home setting, this is accomplished by connecting to the same router that the other devices are connected to. If I’m understanding you correctly, you’re saying that there’s no way to connect your printer to your router with a network cable, as there’s simply no way to route the cable between the two in your house. You could do what I’ve done in similar situations – use a network extender like the TP-Link RE450. Plug it into an electrical outlet near your printer, connect it to your router using your normal WiFi credentials, then connect your printer using a short network cable to the LAN port on the side of the extender. Configure the printer to either have a static IP address or to use DHCP to obtain one from your router. Voila – instant “wireless” network printer. I have an old Ricoh MFP in my house setup using this exact configuration. The old beast just runs too well to replace it with a newer model with built-in wireless networking, and the network extender helps to fill-in a WiFi dead spot in the house. A networked printer would be connected (wired or wirelessly) to the same network as the devices that would print to it. Typically, in a home setting, this is accomplished by connecting to the same router that the other devices are connected to. If I’m understanding you correctly, you’re saying that there’s no way to connect your printer to your router with a network cable, as there’s simply no way to route the cable between the two in your house. You could do what I’ve done in similar situations – use a network extender like the TP-Link RE450. Plug it into an electrical outlet near your printer, connect it to your router using your normal WiFi credentials, then connect your printer using a short network cable to the LAN port on the side of the extender. Configure the printer to either have a static IP address or to use DHCP to obtain one from your router. Voila – instant “wireless” network printer. I have an old Ricoh MFP in my house setup using this exact configuration. The old beast just runs too well to replace it with a newer model with built-in wireless networking, and the network extender helps to fill-in a WiFi dead spot in the house. All very interesting. Does the printer have to stay powered up 24/7? The printer only has to be powered-on when you want to print something. I leave mine on all the time because I use it for network-based scanning and frequent print jobs – it also “sleeps” at a pretty low current draw, so I don’t feel much pain in my pocketbook for doing so. Just had a thought (heel of hand smacks forehead*): The usb cable for the computer is, natch, plugged directly into the router using a usb wall outlet, right behind it. Can I put a signal splitter on that outlet and add a second usb cable to the printer, 3′ away? *I need to stop inflicting injury on myself, physical as well as mental. 1 – Thank you for posting the exact make/model of the printer; it helps the helpers to locate manufacturer data without extraneous dialog. h10032.www1.hp.com/ctg/Manual/c01100561 , a PDF. The manual was copyright 2007. 3. The clock information in the UG appear to be focused on fax usage, sending and receiving. My understanding is that fax machines are intended to be left ON continuously. Thus, the date/time settings normally would be maintained. 4. In the PDF, do a Search for either ‘date’ or ‘time’, to see all the references. See these UG pages for fax-related date/time setting information. UG pages 93-94 = PDF pages 105-106. 5. According to the UG, there are only 3 possible connectivities: USB 2.0 and Ethernet, for computer/network; and telephone, for fax. 11. A USB wall outlet supplies USB-level-voltage power, and is used for charging devices. It is not a signal conveyer. And, USB signals are reliable only up to 5M = 16.4 ft.
Are you sure of the cable connections here? I make no sense of this. 12. If by ‘splitter’ you mean a USB hub, then yes, a physical connection can be made that way. This would be only for attaching additional USB signal cables. But I don’t think that it is right to ‘split’ a power connection. On a powered hub this might be disastrous. 1 – Thank you for posting the exact make/model of the printer; it helps the helpers to locate manufacturer data without extraneous dialog. 2 – For anyone else that wishes to reply to this, the User Guide is at h10032.www1.hp.com/ctg/Manual/c01100561 , a PDF. The manual was copyright 2007. 3. The clock information in the UG appear to be focused on fax usage, sending and receiving. My understanding is that fax machines are intended to be left ON continuously. Thus, the date/time settings normally would be maintained. 4. In the PDF, do a Search for either ‘date’ or ‘time’, to see all the references. See these UG pages for fax-related date/time setting information. UG pages 93-94 = PDF pages 105-106. “The usb cable for the computer is, natch, plugged directly into the router using a usb wall outlet, right behind it.” 11. A USB wall outlet supplies USB-level-voltage power, and is used for charging devices. It is not a signal conveyer. And, USB signals are reliable only up to 5M = 16.4 ft. Are you sure of the cable connections here? I make no sense of this. “Can I put a signal splitter on that outlet and add a second usb cable to the printer, 3′ away?” 12. If by ‘splitter’ you mean a USB hub, then yes, a physical connection can be made that way. This would be only for attaching additional USB signal cables. But I don’t think that it is right to ‘split’ a power connection. On a powered hub this might be disastrous. Now I’m confused- perhaps my terminology is wrong- the desktop is, of course, plugged into a/c power and also connected to the router via a usb cable. This cable is the link to the Internet, no? The message I’m getting is that the printer needs its own direct path to the router for the time/date to renew itself when the printer, normally off, is powered up. The router, in the basement below, connects to the computer via a 5-6′ cable which terminates in a wall outlet directly behind the computer and a short, second cable connects the wall outlet to the computer. So- can I use a two-into-one adapter to get two cables plugged into the same wall outlet, thus bypassing the computer-to-printer connection? And, if I do that, will the printer function as it does now? You have all of us confused. The black one is a USB cable. The green one is a network (RJ45) cable. Which one is connected to your computer and the wall? You have all of us confused. The black one is a USB cable. The green one is a network (RJ45) cable. Which one is connected to your computer and the wall? My fault- black plug matches the end of the printer cable that plugs into the back of the computer. Which one is connected from your computer to the wall then to the router in the basement? Looks like the green one, I didn’t pull it out to check, that would kill my Internet connection. Now I understand why I had everyone scratching their heads- my abject apologies- I forgot that the two cables are different. 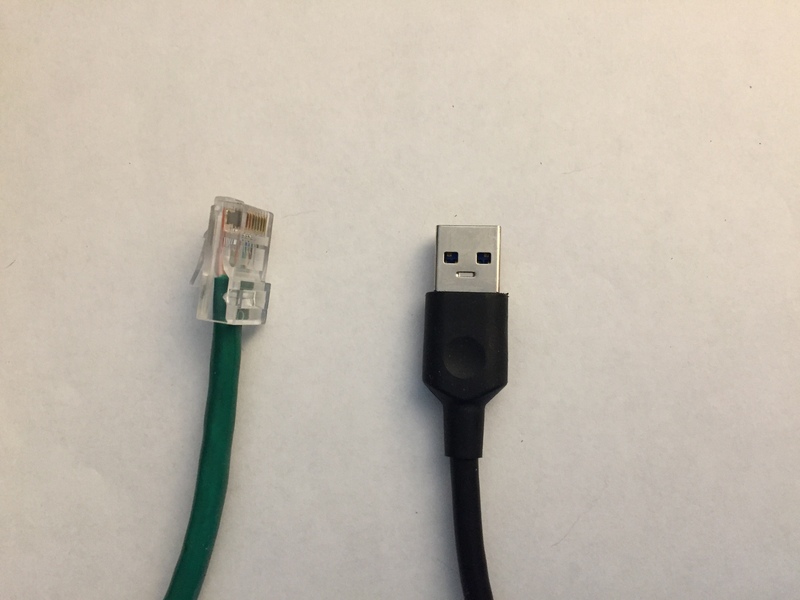 You can’t split the network cable and make it two connections. But it’s possible you could use an Ethernet switch. Plug the switch input to the direct-from-the-router cable and the outputs to the computer and the printer. Don’t know if the printer will work on the switch, though. You can’t split the network cable and make it two connections. But it’s possible you could use an Ethernet switch. Plug the switch input to the direct-from-the-router cable and the outputs to the computer and the printer. Don’t know if the printer will work on the switch, though. I had no idea the OP had a hard-wired connection between the basement router and the PC. A switch is definitely the easiest (and cheapest) way to get the printer networked. Slowpoke, you’d need a cheap ethernet switch – something like this – and two extra patch cables. Plug the switch into a power outlet, then plug one end of patch cable into a switch port – the other end replaces your current PC connection to the wall jack. Plug the PC patch cable into the switch. At this point, you should have a normal internet connection on your PC. Now, plug the other new patch cable into an open port on the switch; the other end goes to the network jack on your printer. You’ll have to to disconnect the USB cable that currently runs from your printer to your PC, then enable the network connection in your printer’s control panel. I’d set a static IP address for the printer so you don’t have to worry about it changing on you when you power things down. Lastly, you’ll have to tell your PC where to find the printer – you’ll add a new printer port using that static IP address, then tell your printer to use that port. This will give you a nice networked printer, but I doubt it’ll accomplish your original goal of keeping the date/time current. Btw, what printer feature are you using that makes the date/time setting relevant? So if I can get a cable in there, it would need the “B” end to connect to the printer and looks like the router end would be like the network cable? Looks like two available ports on the router. … well. Still not sure what you’re really trying to accomplish. This is all rather a lot of work if the only issue is that the printer internal clock is wrong, and based on the printer manuals, it still might not be able to get that updated from the router anyway. DHCP data might well be a working way to set device time even if it doesn’t say that in the manual, DHCP “option” data field 042 is specifically for specifying a network time source; theoretically 152, 154 or 155 might also be used for low precision time sync. It’s just that home routers may not send these… or indeed home routers have occasionally been found to not keep proper time either. To all who posted to this thread, my grateful thanks. Obviously I am not all that tech savvy. My initial interest in sync-ing the time/date stamp has metastasized into quite a group effort on my behalf. When this computer was new, our Internet connection was just a single cable, no router- that’s why the printers connect directly to the PC. Our current ISP uses a wi-fi enabled router as their standard (I think) setup- much more versatile. I have determined that running a second network cable from the printer to the router will be not only possible, but not that difficult. I plan to do that, leaving the PC connection unchanged, and the only hardware I’ll need will be a second network cable. Even if the time/date thing still doesn’t work, the new configuration should allow printing from our laptop, which uses wi-fi, without the PC’s being booted up. And if all else fails, I can presumably revert to the current config. and be no worse off than when I started. OP here- network wiring now reconfigured, printer has dedicated cable and IP address. Running the second cable went fairly easily, once I thought about it- about an hour to snake the cable. Cable from PC to printer now removed. The bad news is that the computer cannot find the printer now using the former default method. The scan and copy functions work as before. This s/shot is Start>Devices and Printers, bottom row #s 4-8 all relate to the printer in question. Note that #5 is the default and the pop-up shows “offline.” Print requests go into the queue and stop. However, printing is successful using “Universal Printing,” whatever that is. The computer acknowledges the printer’s IP address, which I entered. The ping test shows the connection to be correct, as does (I assume) the fact that Universal Printing works. So… where to go from here? EDIT- unable to add image to this post- Help? You need to go to the HP printer software and add a printer. This time it will be a network connected printer instead of USB. The “printer” icon you have in devices and printers is looking at the USB port instead of a TCP/IP port. I did do that, had to reinstall the printer software since I could find no way to change that setting. But on reinstallation, that choice is offered, and I took it. If you have more than one icon in devices and printers for your printer, right click on each one and choose “Printer properties”, choose the “Ports” tab. Find the one with the TCP/IP address box checked and make it the default (right click again on that one and check “set as default”). Then right click on the printer again, “Printer properties” and on the General tab, Print a test page. Now, in the software you need to print from, you have to choose that printer as the default. If you have more than one icon in devices and printers for your printer, right click on each one and choose “Printer properties”, choose the “Ports” tab. Find the one with the TCP/IP address box checked and make it the default (right click again on that one and check “set as default”). Then right click on the printer again, “Printer properties” and on the General tab, Print a test page. Now, in the software you need to print from, you have to choose that printer as the default. The sequence is not exactly as you describe- under the “ports” tab, the correct port is checked, but right-clicking it doesn’t do anything. There is a “configure port ” button under the list, which lets me see the IP address, etc., but pop-ups continue telling me “unable to find.” Print jobs stay in queue. OP here- still in trouble. Couple of hours ago reinstalled the software using the Wizard, all went fine, printed test pages, etc. I was ready to report success. Just tried to print another test doc and the computer once again can’t find the printer, “offline.” Pages go to queue and stop, as before. Network connection active, printer “ready” shows on screen, software in computer installed w/ network option selected, proven by several test pages about an hour ago. Now- no go. Worked fine earlier, no changes made in the interim, now back in the hole. Comments? OK, the problem is probably that the printer is set up on DHCP. With DHCP, the router assigns the IP addresses arbitrarily – the first thing that logs in gets the first IP address, the second gets the second IP address, etc. So things do not always have the same IP address – it’s a “whoever gets in line first” thing. Every time things are shut down and turned back on the order/address can change. When you installed the HP software, the printer had one IP address and the software noted that and assigned that address in the printer properties (remember the “Ports” tab in the properties?). Well, next time the printer may get a different address, and the software on the computer is still looking for it at the first address. So it doesn’t find it….and it doesn’t work. The solution is to assign the printer a STATIC IP address so it’s IP stays in the same place. I am going to give you the example of my network – you will have to plug in the IPs that are equivalent on your network. My router’s IP address is 192.168.1.1 and it is set as a DHCP server (gives addresses to the other things on the network). It has 255 addresses in it’s range: 0-254. Normally, the things that log in (computers, phones, tablets, etc) get the lower numbers. So to keep the printer out of that I assign it the address 192.168.1.200 (I don’t have 200 devices logging in). This is done in the PRINTER menu on the printer itself (Settings/network settings – set up network manually). 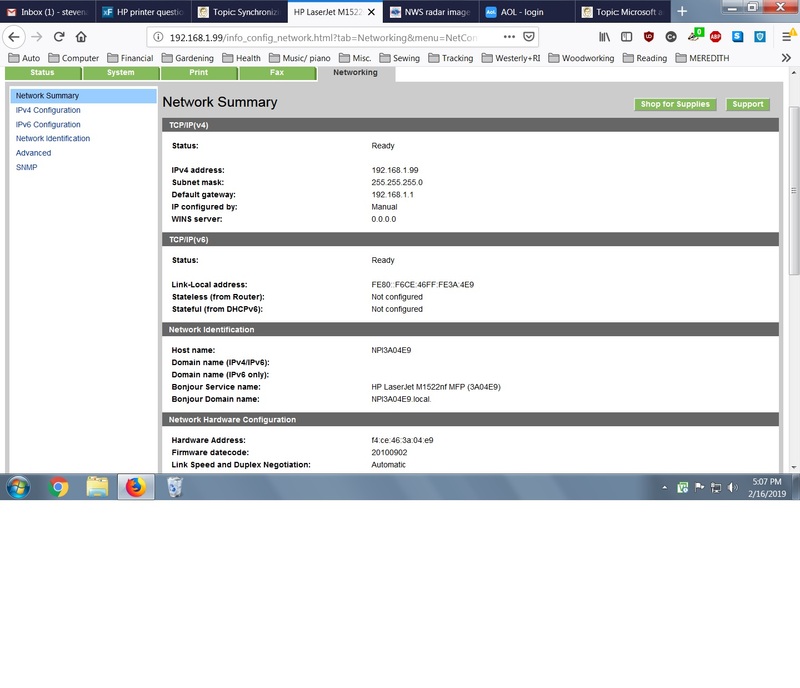 The other numbers you will need to know are subnet mask (which is usually 255.255.255.0) and default gateway (which is the router’s IP, in my case 192.168.1.1). You will also have to know your network SSID and password (the same network name and password you put in when you connect a phone wirelessly). That’ll again depend on specifics. Some routers (yes, even some “home” models, and they usually don’t advertise this anywhere…) do keep a list of DHCP clients by network adapter hardware id (also called “mac address”), even over router reboots. In some cases it’s also possible to configure the router / DHCP server to always give the same IP to a given mac address. This may be more common than the permanent list of clients but requires access to router configuration at a minimum, and even if the router has this capability it may not be easy to use. Is this the same Windows Update that handles the usual updates? If so, I learned on this forum and elsewhere never to make it automatic. What’s my next move? Thank you. Please see my screenshot, posted today, from the troubleshooter function for the printer. Do I have to do something about this, before or after I follow your advice? No, just set a static IP in the printer menu and install the HP software so it sees the static location. I can almost guarantee that is the problem you are having. Many thanks, I seem to be back in business using your advice. Not ready to declare victory yet, though- I was at this point earlier today. I did have to restart the computer several times for other reasons, which aligns with your comment about the PC losing the printer due to a changed address. Side note- this printer no longer shows up in the All Programs list, and the software is not in the Uninstall a Program list. As long as it works, I don’t care. Restarted PC as a test- now printer is once again “offline.” The new IP shows correctly on printer screen, in Properties (see attached) and the router has the new IP also. I thought I followed your steps, but I must be missing something. Sorry for being so dense about it. @slowpoke47. First, PKCano’s advice is 100% on. The only thing that would work consistently for me was a static IP address. My printer is an HP1505n (believe it was purchased around 2007) for which I struggled with similar problems. What was most helpful for me was to print a self test configuration page from the printer. Not exactly sure of your printer setup. Turning on the PC may not be needed yet, but to cover all bases, turn on your computer. You will need it in a minute anyways. Print a Printer Self Test/Configuration page using a special keyboard combination on your printer. Check your printer manual for the exact instructions on how to do this. I found that my printer’s manual was NOT correct and I had to – Turn on the printer 1st. Press the green go button and red X at the same time and keep holding it down until a page starts to print. From the printer self test configuration page you will see what ip address is assigned to your printer. Go back to your computer. You should be able to access the printer settings in a browser by typing in the IP address shown on the printer self test configuration page into the address bar of your browser. If it does not work try using another browser. My browser displays the name of my printer and several tabs. Look for a menu to allow you to enter the same static IP address that you added during the setup of your printer. In my case I selected the Networking Tab, Put a dot in manual ip address and changed the IP address to the static IP chosen early. Select apply. For good measure reboot the PC and turn the printer off and back on. Caution be sure to use the same key combination on the printer when printing your self test configuration page. In my case using the same key combination starting with the printer off , wiped out all my printer settings and put back to dhcp defaults. Meaning I had to put the static ip address in the printer setting page in my browser all over again. Good luck, it is worth the effort once is working well. Advice to write down details what you did once you get it working, because one day something may wipe out your printer settings and you will need to repeat. @slowpoke47. First, PKCano’s advice is 100% on. The only thing that would work consistently for me was a static IP address. My printer is an HP1505n (believe it was purchased around 2007) for which I struggled with similar problems. What was most helpful for me was to print a self test configuration page from the printer. Not exactly sure of your printer setup. Turning on the PC may not be needed yet, but to cover all bases, turn on your computer. You will need it in a minute anyways. Print a Printer Self Test/Configuration page using a special keyboard combination on your printer. Check your printer manual for the exact instructions on how to do this. I found that my printer’s manual was NOT correct and I had to – Turn on the printer 1st. Press the green go button and red X at the same time and keep holding it down until a page starts to print. From the printer self test configuration page you will see what ip address is assigned to your printer. Go back to your computer. You should be able to access the printer settings in a browser by typing in the IP address shown on the printer self test configuration page into the address bar of your browser. If it does not work try using another browser. My browser displays the name of my printer and several tabs. Look for a menu to allow you to enter the same static IP address that you added during the setup of your printer. In my case I selected the Networking Tab, Put a dot in manual ip address and changed the IP address to the static IP chosen early. Select apply. For good measure reboot the PC and turn the printer off and back on. Caution be sure to use the same key combination on the printer when printing your self test configuration page. In my case using the same key combination starting with the printer off , wiped out all my printer settings and put back to dhcp defaults. Meaning I had to put the static ip address in the printer setting page in my browser all over again. Good luck, it is worth the effort once is working well. Advice to write down details what you did once you get it working, because one day something may wipe out your printer settings and you will need to repeat. The situation here has regressed from this morning. Previously I could get printer info using the IP address, today nothing, “times out.” I know from experience that I can reload the software and the printer works until the PC is restarted, so I know PKCano is right. Can you cookbook me through setting a static IP address for the computer? Use the printer software. If you can add a printer (under the HP software in the menu) do that. If not, reinstall the printer software and let it find the printer on the network again. You have to be sure that all three of the numbers are correct (not the ones I stated for my network) – fixed IP in the range of your router, subnet mask, and default gateway (the router’s IP address). That link isn’t going t work. It has to be https:// But the “Select File” box should be availabel for you in the lower left of the entry to attach a picture/screenshot.. This covers the opening screen, header clipped to fit in two s/shots. Printer software currently reinstalled, so printer will work correctly until PC shut down. Software installation via Add a Printer does not put an entry on the All Programs list as previously and the software does not appear in the list at Uninstall a Program. Fax and scan options no longer available in PC. OK. Turn the printer off. Uninstall the HP software in Control Panel. In Devices and Printers, delete any icons you have for the printer there. 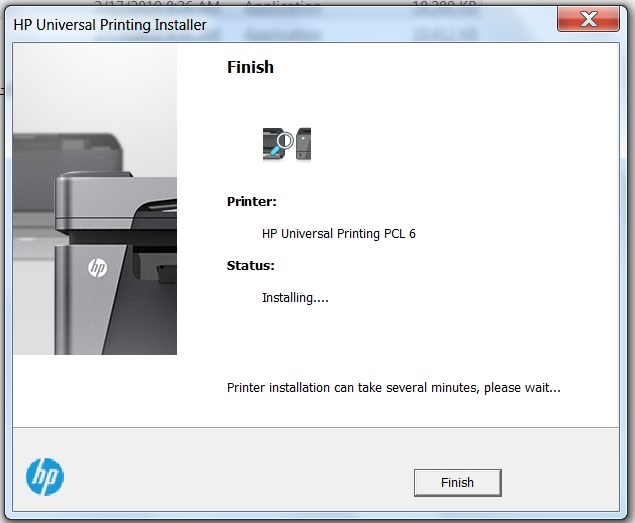 Reinstall the HP software – when it asks check the network connected printer, turn the printer on, and let the soHP software find it. Continue the installation till the HP s/w is through. Set it as your default printer. (There may be two icons – one for printer and one for fax). There is probably a built in MS printer driver for your printer. 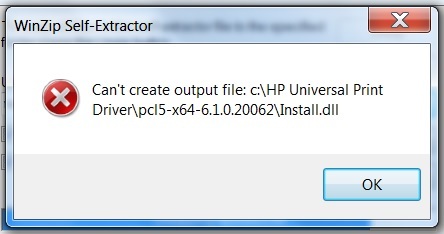 If your computer picks that up and uses it, you won’t have the full featured HP software. Sorry, HP printer installation can be a bear. OK. Turn the printer off. Uninstall the HP software in Control Panel. In Devices and Printers, delete any icons you have for the printer there. Reboot the computer Reinstall the HP software – when it asks check the network connected printer, turn the printer on, and let the soHP software find it. Continue the installation till the HP s/w is through. Set it as your default printer. (There may be two icons – one for printer and one for fax). There is probably a built in MS printer driver for your printer. If your computer picks that up and uses it, you won’t have the full featured HP software. Sorry, HP printer installation can be a bear. I did exactly this at least twice, most recently about a half hour ago. I do think the driver is the built-in one, as the fax and scan functions are MIA. What I plan to do, unless advised otherwise, is to go to the HP site, get the software from there, and start over. Many thanks for your persistence with this. It’s now approaching Sat. night here in my time zone, not sure where you are, but you probably would like a vacation from this thread. I’ll get into this with a fresh start tomorrow and post back- thanks again. Hi, @slowpoke47. I don’t want to confuse with additional information since PKCano is working with you and she is very knowledgeable in networking and me not so much. There are only a few things I would like mention since I had similar issues. 1) I had a horrible time setting up my network HP1505n printer for both Windows 7 and Windows 8. 2) Had to install the HP LaserJet Full Feature Software and Driver for my printer in order to get it to work on both PCs. The HP driver only would not work. 3) I used a static IP for the printer which I set in the printer settings via browser and made sure same IP was in the port settings for the printer in the computer. Some good news is the printer worked fine with the drivers provided by Microsoft for Windows 10 without me needing to do anything at all. You are likely on the right track getting the HP drivers and re-following PKCano’s instructions. I do have manual instructions that I used for myself to manually configure the printer’s static IP in the computer, but again I do not want to confuse or conflict with any of PKs instructions. Not to be a source of confusion but you might want to try to bind the MAC Address of the printer to an ip address in the router. It is the router that hands out ip addresses for other devices/computers to use not the other way around. This also prevents ip changes/conflicts when you recycle the power on the printer or computer. In the router under DHCP there will be an option called something like Address Reservation. Do not bind it in the wireless section! You may also have a separate option called IP and MAC binding do the same there with the exact same numbers. Also your Printers “HP all-in-one M1522nf MFP” Firmware is out of date. • Fixed an issue that under a certain case printing over the network does not work unless a cold restart is performed. • Fixed a paper size localization issue in control panel copy menu. Currently on HP site for driver downloads. 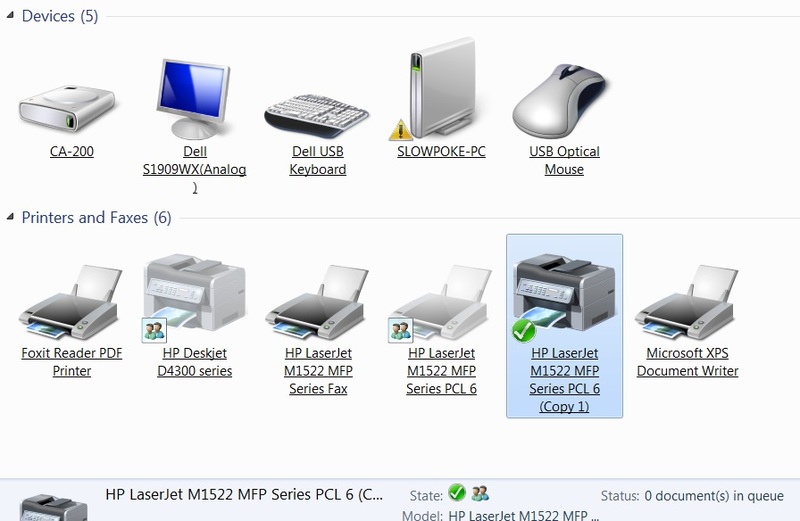 HP LaserJet M1522nf Multifunction Printer – Driver Downloads | HP® Customer Support 5 options listed for the main software file for W7 64 bit. not sure which one to use, so I’m going with the largest one, pending advice otherwise. Also downloaded 2018 PCL6 update for X64 and 2018 update name upd-ps-x64-6.6.5.23510.exe. You should get the full function download. It is probably going to be the first one on the list and the biggest. Thanks, I’m working on that, also the most recent updates on that list. Thai’s today’s project, trying to be deliberate about it. I do have the disc that came with the printer, but the dates on the HP site are more recent. 4 software installations complete from HP site- main driver package and 3 more recent updates. PC still cannot find printer, shows “offline.” Start>Devices and Printers>(icon)> Printer Properties shows correct info, (same)>Properties mostly blank but has the printer name. Reports generated directly from the printer show the IP, etc. as being correct. 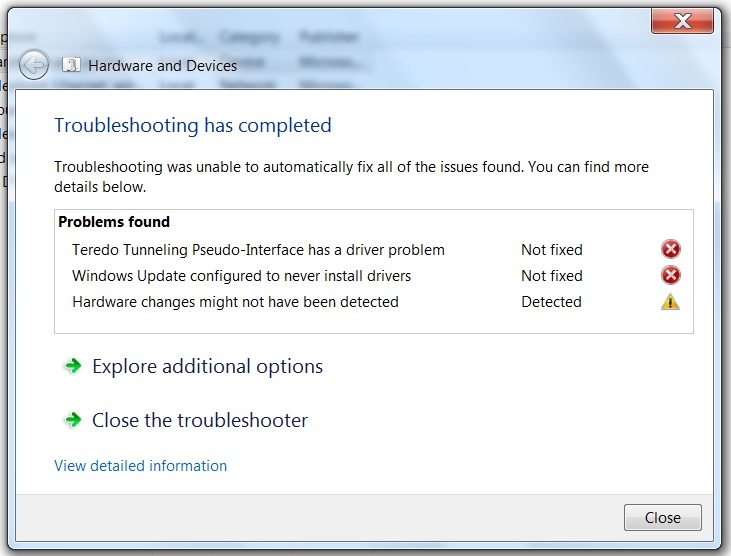 The troubleshooter option in the corresponding pop-up in Devices and Printers returns nothing. Unable to determine why the PC cannot find this printer. I know I asked this before, but is this worth looking into? We know the network connection is good- successful ping and test page yesterday, and green signal light on back of printer shows ok.
Is there a way to tell the PC to look for this printer? Use Syst Restore to go back to when printer was directly connected to PC and revert to USB cable. Reinstall the software today and choose the USB option (unable to change that alone). Add USB cable to current hookup, leave both connected (may or may not work). What did you download? Here’s what I see on the HP site – the software is not available. I used the largest of the large files (see drop-down arrows on rt.) and 3 smaller ones. Also, an update- Control Panel>Network shows this map- note the center top icon is actually the printer, called by the model name elsewhere. Could this be the problem? How and where should I look to make them all match? The above screen does not permit renaming. Did you pick the right series for your printer? All you should have downloaded is the full function for your series. Did you pick the right series for your printer? All you should have downloaded is the full function for your series. Yes, but there are 5 choices, I used the largest one, which I believe is what I had. Notice that the dates on those are several years old. The others are updates, also previously installed. After the main install, I did try to print, no joy. Tried again after each individual update, same result. Seeing the network map I posted, I suspect the lack of communication may be due to inconsistent naming within the system of this printer. Maybe I should try to remedy that. Elsewhere the printer is ID’d by the model name- this map shows the default name given by the router when the connection was first made, now changed in the router to PRINTER. Even though the IP’s match, the names do not. Note that the newer version is a different icon. With this as the default printer, printing is successful. Rebooted PC (the Achilles heel of yesterday), this icon still shows “ready” and prints on demand. The original one, to the left, is still ghosted, no idea why. Don’t care either, as long as printing function is ok.
Never did achieve my original intent, to sync time/dates. I’m certainly going to let that sleeping dog lie, learned my lesson. As of now, looks like the new network config is working as expected, good enough for me! Can’t thank you enough!